WHAT: “Fireworks,” the first of five new titles announced by GKIDS presented through Fathom Events, will premiere in movie theaters nationwide on July 3 with encore showings on July 5 and 7. The film will receive a theatrical release by GKIDS starting July 4. 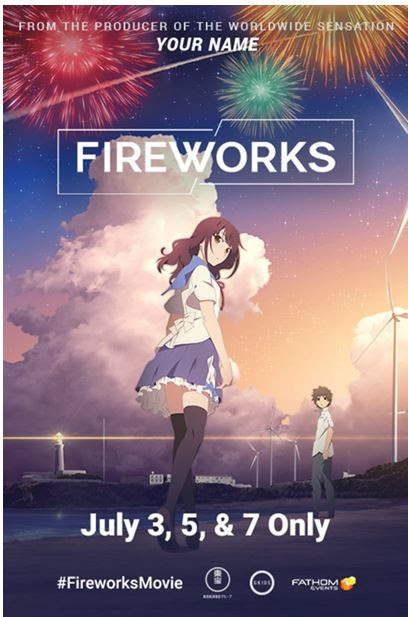 “Fireworks” is the newest release from Toho animation and producer Genki Kawamura, following the worldwide blockbuster “Your Name,” the highest-grossing anime of all time. It will be shown in both its original Japanese version and a new English-language version produced by GKIDS. “Fireworks” is a story of adolescent longing with a sci-fi fantasy twist, from the producer of the global mega-hit “Your Name.” It is a wistful tale of young love and missed opportunities, and the desire to create a separate universe, a magic place outside of time, where they can be together. WHEN: Tuesday, July 3 at 7:00 p.m. local time (English-language subtitled). Thursday, July 5 at 7:00 p.m. local time (English-language subtitled). Saturday, July 7 at 12:55 p.m. local time (English-dubbed). WHERE: Tickets for “Fireworks” can be purchased online by visiting www.FathomEvents.com or www.FireworksMovie.com and at participating theater box offices. Moviegoers throughout the U.S. will be able to enjoy these events in nearly 500 select movie theaters. For a complete list of theater locations visit the Fathom Events website (theaters and participants are subject to change).